Bending and swaying in unison like tawny tassels of tall grass rippling in a late summer breeze, singer/song writer, Dan Frechette and violinist, Laurel Thomsen, boots and bare feet on the simple Corralitos Open Farm Tour stage, sang to an intimate throng of young families and barnyard critters in early October. A chorus of baby goats and a Biblical sized sheep provided unexpectedly hilarious accompaniment while a gaggle of youngsters commandeering four-legged accomplices ran in capricious circles. Right on schedule, a tractor pulling families beaming and bumping along on hay bales spent the day making the rounds. The Crooked Road had just wrapped up the morning’s music and we had time to grab lunch from one of the local vendors at this annual farm tour held at the Agriculture Museum at the Santa Cruz County Fairgrounds and enjoy Dan and Laurel’s fresh roots-folk. It was our first time. We sat on the edge of the stage enthralled by perfect harmonies and enchanting lyrics, watching children and baby animals frolic, swept into an easy, rhythmic day dream. I’d actually just spent an afternoon the week prior chatting with Dan and Laurel over coffee at White Raven. Strangers at the time, serendipity put us together on that farm tour stage a few days later and presented the opportunity to appreciate the music first hand, the words of the artist interview manifested in live performance. And a new friendship was kindled. Dan is a force. With his engaging energy and gift for bringing people together, he told me, “I asked to play at lille aeske…that’s how it starts with me for a lot of things.” On the night before Halloween, the duo will play as part of the downtown Boulder Creek art house collective’s Performance Series. Laurel says, “It’s really cool to be able to play an intimate concert close to home.” The show is sold out. Dan and Laurel have done two CDs together. “She tailors these great violin parts that are intertwined with the song,” Dan says. She loves how he has so many different styles of original songs. 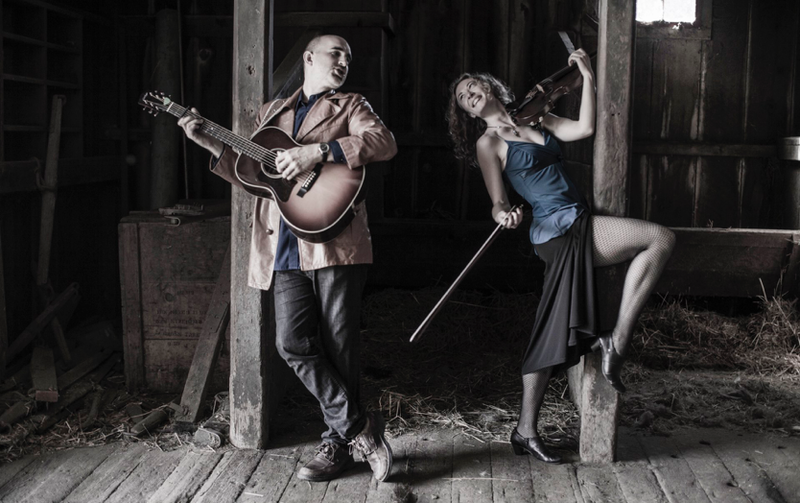 They’ve honed together the harmonies, interweaving the fiddle and guitar into what she now calls the “Dan and Laurel sound.” They both love surfing along on the wave of the music and what the audience gives back in return. The couple agrees: “The music is an adventure. It’s best having no expectations…only trying to be prepared for magic. The focus is more on the really awesome times…this is our journey. You have to have a genuine path…the people who are there really want to be there…it’s not a popularity contest.